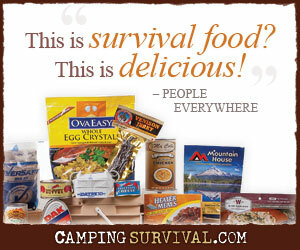 The following article has been contributed by a fellow prepper and regular commentor to PreppingToSurvive named Jeff. It has been published with permission of the author. I read, ok I read A LOT, mostly about survival and prepping and there is one prep that I rarely hear mentioned. The prep is the Bible!! I understand that not everybody that might read this post believes the Bible and that you might feel that this is not a necessary prep. To those that don’t believe I would like to offer a few thoughts. It is a great historical record of the times that it was written in. It has beliefs and concepts that transcend the time of its writing, for instance most if not all of the principles of the Constitution of the United States come from the Bible. It has wonderful stories about real people, just like you, and how they handled things in their lives in godly and ungodly ways. If you truly are a serious prepper, then take a good hard look at what is going on around you, then read a bible, I think that you will find it to be Very accurate for what is occurring right now. For those of us that count ourselves followers of Christ there can be no greater prep, and no I am not necessarily talking about going out and buying a bunch of bibles (although that is always a good idea). I am talking about taking it down off the shelf NOW and reading it, studying it, getting it into your heart. There will come a time when people will take your bible away from you and you might not be able to stop them. But if you have large portions in your heart, because you have studied, and meditated and read, then NO ONE will be able to take it from you. The there is my prep. I suggest the small pocket size bibles. Fit in your pocket. Easy to hide. Maybe they won’t find that one small bible you hid under the carpet, or in a coffee or sugar container. That is a great idea! Maybe one in the 5 gallon bucket of rice! Awesome post! We are working on memorizing the Word, and we have one in our “go” bag. But I love the idea above about hide one of the sugar container or such. I pray it doesn’t come to that, but wouldn’t be surprised. Thank you I am glad that you liked it! Great article. The best website I have ever read about bible prophecy and the times we live in is http://www.thetrumpet.com. All my fellow preppers should check it out! Jeff, times of adversity are when we will need to rely most on the hope offered within the pages of our Bibles. Very good points and I believe I too will start putting a few pocket-sized Bibles into the remaining spaces in big buckets before sealing them up. They will stay dry and safe until I need them for myself or others. Amen brother! I have been preoccupied for the past 3 years one with trying to suppress my sincere dislike of the incredible foolishness coming from the White house-Washington, second prepping. I have taken my eyes off God and put them on the world. I have even seen the root of hate pop up! Time to make time with God my most important prep. A guest post I did for a great site run by wonderful people!